At Fox Valley Veterinary Service we offer the highest level of care for your feline family member, and treat them like they were part of our own family. Our dedicated Veterinarians believe in providing the finest professional healthcare recommendations. We work in partnership with pet owners to provide individualized care that is unique to each pet's lifestyle needs. Our proactive philosophy has an emphasis on wellness and we share with you how to keep your pet healthy throughout their lifetime. Our friendly, compassionate team is experienced in providing a number of services from whisker-to-tail to help your loved one live a longer, happier life. We are committed to providing a stress free visit for your feline family member. This means we believe in the respectful handling of cats to reduce fear and anxiety. We also use a natural pheromone "FELIWAY" to help them feel comfortable in their environment. We know very well how fearful some cats become with the slightest hint (usually the sight of the dreaded carrier) that they may be leaving the safety and comfort of their home. Get those cat carriers out! 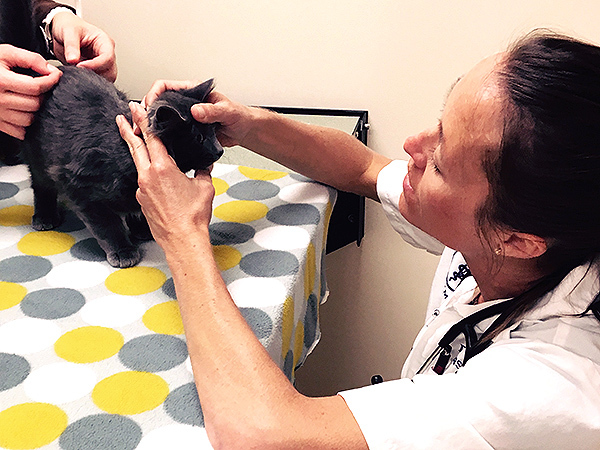 Cats need a safe place, especially at the vet clinic. So treat your cat's carrier like a piece of furniture. Keep it cozy with their favorite blanket, toys, treats and catnip. If they are used to their carrier and use it to sleep and/or play in, you will be amazed! This could help reduce or eliminate the stress of traveling. Before coming to visit us, if your kitty does not like to travel, please ask us for a sample of a FELIWAY wipe, to wipe the inside of their carrier with and place in their carrier. This will help reduce the stress of traveling in the car.